Groomer. Make an appointment, drop your dog off, pick them up clean. I use this for emergencies, like the time Teddy rolled in something so stinky that I still couldn’t be in the same room with her after three baths! Dog wash. 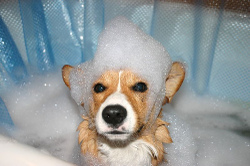 There are dog wash businesses that have all the facilities for washing your dog from a tub with ties to shampoo to hair dryers. Definitely the easiest do it yourself way. Bath tub. To be avoided at all costs unless you have a small or very docile dog. Shower. This is my favorite. I get in the shower with the dog. They have no where to go and usually stand still with their tail between their legs while you soap them up and rinse them off. Beware when you let them out though! Everything will get wet! I usually turn off the water and give them a few minutes in the shower to realize it’s over and to shake well. Then I dry them off and wait to see if they’ll shake again. Then I let them out in the bathroom. A hose in the backyard. I hang on to the collar with one hand and wet, soap and rinse the dog with the other hand. This is the hardest method physically and usually the messiest – but the mess is outside. Any other ways you wash your dog? Any tips for us? When our boxer was 3 we got a rescued mix as a 5 month old pup. They got along great and really loved each other for 3 years. Recently we got a new 11 week old pup. The boxer and pup are females and get along great but suddenly the middle dog ( the one that’s now 3 yrs old) started attacking the boxer . He’s fine with the pup who is actually a bit aggressive in a playful way . Is there a way to get the boxer and the second dog to be together without a crisis again? And what’s the best way to calm the puppy down from her bite playing? What happens when you take the puppy out of the mix for a while? Is it possible the middle dog is jealous of the attention the boxer gives the puppy? The best way to calm a puppy down when they play too rough is to stop playing. When you don’t like how the puppy is playing, stop, walk a few steps away and don’t look at the puppy. Wait until it calms down to look at it and play again. I have a Shih Tzu Maltese I Potty Trained her & She was doing well. I took her to another Home we have & She’s Pottying in this House.Sometimes She will go to the Door to go out .Other times She will Potty rot in front of me. Any Advice would be appreciated. I put my arm under his belly and hold his front leg furthest away from me. I wet him gently and soap him. After a few mins I rinse his body and wrap him in a bath towel to dry him. All the t8me talking to him and praise him for being good .